Omez (Omeprazole) is considered useful in treating a wide range of problems affecting the stomach, such as ulcers, acid reflux, gastroesophageal reflux disease, Zollinger-Ellison syndrome, indigestion and other conditions related to excess acid production by the stomach. 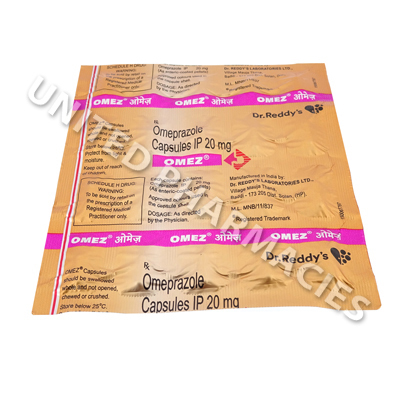 Omez (Omeprazole) is considered useful in treating a wide range of problems affecting the stomach, such as ulcers, acid reflux, gastroesophageal reflux disease, Zollinger-Ellison syndrome, indigestion and other conditions related to excess acid production by the stomach. It is frequently prescribed to treat or prevent ulcers caused by helicobacter pylori (a type of bacteria). This drug works by reducing the amount of acid produced by the stomach, which helps to provide relief and allow healing in the stomach of patients affected by the conditions listed above. It is very important to note that the dosage for patients taking Omez (Omeprazole) capsules can vary from patient to patient, and will be decided by the prescribing doctor based on the condition being treated. It is possible that your doctor will tell you to take the medicine 1 hour prior to eating. Some patients may be told to take it once per day, however, some patients treating Zollinger-Ellison syndrome may be told to take it 3 times per day. Those who are treating indigestion may be directed to take it once per day for 14 consecutive days. There is a risk of serious side effects associated with this drug. If you notice muscle spasms, seizures, tremors, severe stomach pain, watery stools or any other adverse reactions which have not been listed here, you need to go and see your doctor or seek medical attention straight away. This drug is in a class of medications known as proton pump inhibitors. These medications are known to increase the risk of fractured bones, such as the wrists or hips. Patients who take high doses or who take for a period of one year or longer are considered to be most at risk of this occurring. Patients with a medical history of liver disease must inform their doctor of their condition prior to commencing treatment with this drug. Always use Omez (Omeprazole) as you have been prescribed by your doctor. Never self-medicate or change your dosage without first consulting your doctor. The correct dosage can vary depending on your health, medical history, and the severity of the condition being treated.